How does Main Street “Brick & Mortar” survive and THRIVE? The West Queen West (WQW) is the Art & Design District, the Creative Heart of Toronto, and one of Toronto’s amazing 82 BIAs. The WQW Board and its 400 members share the same philosophy; every day is a day to celebrate “Art & Culture”, all the while bringing commercial success to everyone in the neighbourhood. September 5th, 2014- Vogue International declares WQW the 2nd Coolest Neighbourhood in the World! BUT times are changing; so how does WQW, its SMB, its “Brick & Mortar” continue to not only survive, but THRIVE? 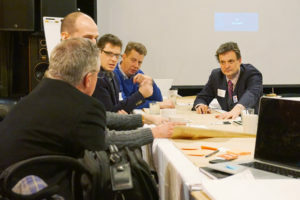 What does Main Street “Brick & Mortar” need to do? Small Business must start acting like BIG Business; and thanks to digital technologies they can do that. WQW has started down this path successfully. Why not in WQW and our Brick & Mortar? 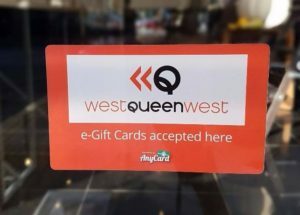 In November of 2016, WQW partnered with #Any card and introduced the #FIRST neighbourhood e-Gift-Card. WQW E-Gift-Cards can be used at Over 80 WQW members. The customer simply shows the e-gift card on their mobile device in-store and the merchant logins to the AnyCard portal, enters the 9-digit authentication code and amount being redeemed. The whole process takes seconds and the customer is on their way. Digital Gift card sales are estimated to reach $15 Billion by 2017. 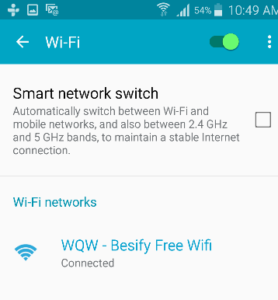 WQW has partnered with Besify to offer Toronto’s First Neighbourhood Free Wi-Fi (WQW Free Wi-Fi). WQW – Free Wi-Fi will cover the entire 2 kilometer WQW stretch on Queen Street West from Bathurst to Gladstone. Visitors to WQW will be able to use the WQW Free Wi-Fi during their entire visit to WQW. Visitors can shop, dine, watch a show, listen to great bands live, and share their experiences in WQW on their social media outlets, all the while logged on to Free WQW Wi-Fi. WQW will now be able to get valuable analytics to help us spend our limited budget wisely and successfully. Thanks to digital technologies Shopping local has never been easier, convenient or fun. Now’s the time for Main Street “Brick & Mortar” to start acting BIG!